Offer a radiant multi-coloured spray, hand-designed by our expert local florists. This elegant composition is arranged with white roses and chrysanthemums balanced with pink gerberas and red seasonal flowers. Your funeral arrangement will be meticulously handcrafted and delivered by a local Teleflora artisan florist to the destination of your choice (home, funeral parlour, place of worship, ceremony or cemetery). 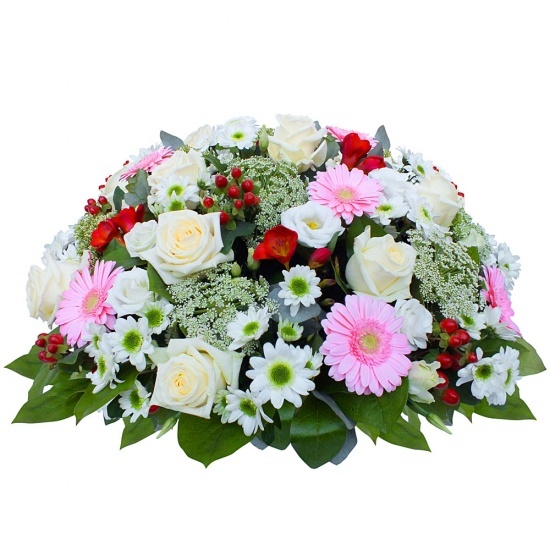 This flower arrangement requires specific expertise and precise delivery conditions. You will be asked for the date and time of the ceremony when completing your order. Your product can be delivered with a ribbon. You can add this option in the next step of the ordering process. This funeral spray includes a stand or container which is not suitable for cremation. At Teleflora we offer 4 hours flower delivery all-year round, including Sundays and public holidays. When you buy on teleflora.es, your order is sent to one of our 1800 artisan florists located across Spain. Then, Stunning fresh flowers are handcrafted by our local florist and personally delivered. Our florist will arrange a delivery attempt with the recipient of your order. We will try that the bouquet you ordered is as similar as possible to the one you receive. However, be aware that varieties, colors and container may vary due to local availability. Place your order and receive loyalty points! Copyright © 2017 - Teleflora - With more than 50 years of service experience dedicated to floral services in Spain, 1800 artisan florists located across Spain and over 60000 affiliated florists outside Spain. This extensive national and international network, coupled to the expertise and commitment of our florists, means you are in the best hands.